Moving to Palos Verdes Estates? Meathead Movers is fully equipped and prepared to make your next move quick and hassle-free. Our student-athlete Palos Verdes Estates movers are dedicated to efficiently fulfilling all your moving needs. Many of those who make their home in Palos Verdes Estates commute to work in nearby Torrance, Redondo Beach and Los Angeles. If you’re moving to the area for a new job or otherwise, you’ll want to check out what our Palos Verdes Estates movers can do for you. Known as the “gem by the sea”, Palos Verdes Estates is a beautiful place to call home with an abundance of open space and mesmerizing ocean views. The city is home to an award-winning golf course, great dining options, a 12-court Tennis Club, a beach and athletic club, and stables. For those who enjoy the outdoors, Palos Verdes Estates has miles of shoreline and ocean bluffs to explore. Additionally, the city is home to a great school district, making it a great place to raise a family. If you are considering a move to this picturesque city, Meathead Movers is here to help you! 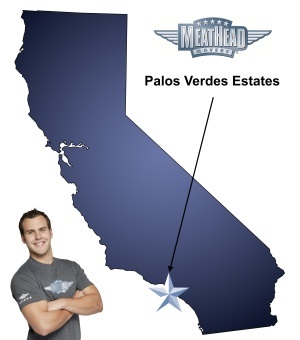 Meathead Movers is the top moving company in California for long-distance, commercial, and local moves. Unlike other Palos Verdes movers, we offer fixed pricing plans for long-distance moves and a 100% satisfaction guarantee. All our movers are hard-working clean-cut student-athletes who are trying to make a few bucks when they’re not attending classes. Our movers will also show you our trademark Meathead hustle. When our movers aren’t packing or loading boxes into the truck, they’ll jog to where they need to be next. If you need help packing away fragile items, our sister company, Princess Packers, can help you out! Princess Packers is full of professionally trained students who will carefully pack away your fragile items to ensure they make it safely to your new home. We are also proud to offer long and short-term storage services. Additionally, if you’re in a jam and need a babysitter, a housecleaner, a landscaper or any other service provider, our signature concierge service can connect you any day of the week with several Meathead-approved businesses that can help. Our Palos Verdes Estates movers takes the hassle out of moving. With a 100% satisfaction guarantee, you have nothing to lose. Give us a call today to learn more about what the Meathead Difference really means. Our staff can even give you a no-obligation, no-cost move quote. Moving to Palos Verdes Estates? Here are some helpful resources. Moving from Palos Verdes Estates? “1) Movers were equipped with a single dolly, which created a bottleneck and made the movers extremely inefficient. 2) Movers were not “professionally” trained and very clearly immature students that were not used to handle extremely expensive custom-made furniture that is certainly not the Ikea furniture they appear to be used to. 3) Movers did not wear gloves or properly protect flooring and walls, leaving hand prints all over every piece of expensive, delicate furniture and scratches all over the walls and floors. 4) Movers broke two items of furniture, chipped the dining room table, dented the file cabinets, scratched the corner of a wooden bed frame, and lost a box containing vital medications along with china bowls, coffee, and k-cups. All together, the damage and lost items have a monetary value of over $10,000. 5) Movers were not equipped with property safety equipment, such as back braces. I was genuinely worried someone would hurt himself. I now have to be without vital pieces of furniture for months until I can get someone out to fix the broken items. Moreover, I now have to pay for professional cleaning for my entire home and all of the furniture items. I also have to pay to have the walls and floors repaired. I JUST resurfaced all of the floors and repainted the whole home before the move-in. The whole experience was a complete disaster and I will be paying thousands to fix everything the move-in damaged and dirtied. I did, however, enjoy the service of the Princess Packers. They were efficient and extremely professional. View more Palos Verdes Estates resources. 1) Movers were equipped with a single dolly, which created a bottleneck and made the movers extremely inefficient. 2) Movers were not "professionally" trained and very clearly immature students that were not used to handle extremely expensive custom-made furniture that is certainly not the Ikea furniture they appear to be used to. 3) Movers did not wear gloves or properly protect flooring and walls, leaving hand prints all over every piece of expensive, delicate furniture and scratches all over the walls and floors. 4) Movers broke two items of furniture, chipped the dining room table, dented the file cabinets, scratched the corner of a wooden bed frame, and lost a box containing vital medications along with china bowls, coffee, and k-cups. All together, the damage and lost items have a monetary value of over $10,000. 5) Movers were not equipped with property safety equipment, such as back braces. I was genuinely worried someone would hurt himself. I now have to be without vital pieces of furniture for months until I can get someone out to fix the broken items. Moreover, I now have to pay for professional cleaning for my entire home and all of the furniture items. I also have to pay to have the walls and floors repaired. I JUST resurfaced all of the floors and repainted the whole home before the move-in. The whole experience was a complete disaster and I will be paying thousands to fix everything the move-in damaged and dirtied. I did, however, enjoy the service of the Princess Packers. They were efficient and extremely professional. All in all, I would NEVER recommend Meathead Movers to anyone. I have been a Realtor since 2011 and I coordinate many, many moves every year. This is not how moves are supposed to go, especially at the prices that Meathead Movers charge. I will NEVER use Meathead Movers again nor will I ever recommend Meathead Movers to any of my clients. They accept all types of moves and special requests, as they got my move done perfectly and it was very weird.